These Gluten Free Banana Nut Blondies happened on a whim in my kitchen, but they are here to stay! The perfect blend of banana sweetness and a nutty punch combined into the perfect chewy texture… I know you’ll love them! 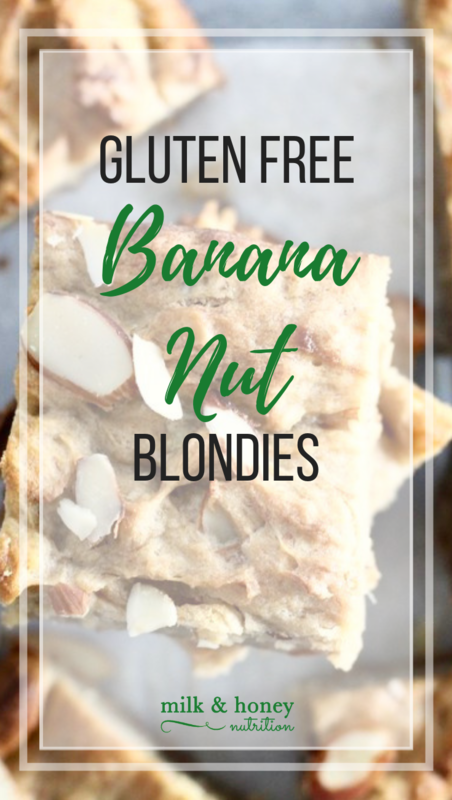 Let me know if you try these Gluten Free Banana Nut Blondies! Note: I use a gluten free flour blend for these Gluten Free Banana Nut Blondies, but you can also substitute in all purpose flour if you don’t need them to be gluten free. Preheat your oven to 375 degrees (F). In the bowl of a stand mixer, combine the butter and coconut sugar. Mix until combined. While the mixer is running, add in the eggs (one at a time), bananas (broken into 2-3 inch chunks), and extracts. Let everything mix for 60-90 seconds until fully combined. Stop the mixer and add in the gluten free flour and baking powder. Mix just until combined. Finish mixing by hand with a rubber spatula until no more loose flour remains. Mix in the sliced almonds. Spread the batter into an 8x8 pan lined with parchment paper. Bake for 25-30 minutes until a knife inserted in the middle comes out clean.